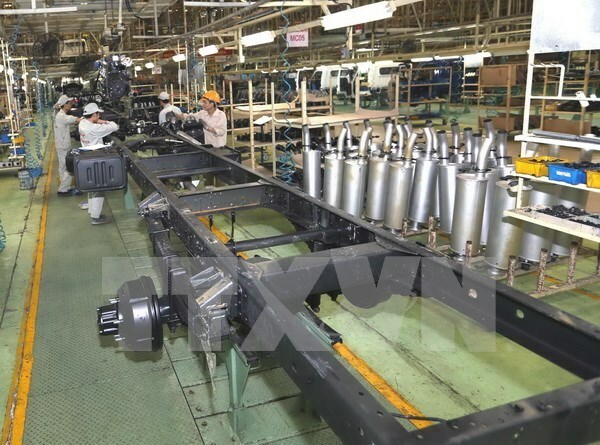 Hanoi (VNA) – The national index of industrial production (IIP) was estimated to rise 7.4 percent in April, reported the General Statistics Office (GSO) on May 1. According to the GSO, in April, the IIP of the mining sector saw a drop of 5.6 percent, while that of the processing and manufacturing industry rose 11.1 percent, the electronic production and distribution was up 9.9 percent, and water supply and waste treatment increased 6.5 percent. In the first four months of this year, the index increased 5.1 percent year on year, far below the growthrecorded in the same time of 2016 but higher than the rise of 4.2 percent in the first quarter of 2017. In Jan-April period, the processing and manufacturing sector’s production surged 9.2 percent and the water supply and waste treatment industry up 6.3 percent, while that of mining fell 9.7 percent. A number of sectors enjoying a surge in the IIP includedmetal production (47.5 percent), metal product manufacturing (13.3 percent), weaving (12.5 percent) and engine vehicles (10.9 percent). Meanwhile, industries experiencing slight IIP riseswere food production and processing at 6.4 percent;medicine and pharmaceutical chemistry 4.5 percent; and electronic, computer and optical product production 4.2 percent. The northern city of HaiPhong led the country in the IIP growth with 20.4 percent, followed by Thai Nguyen with 17.7 percent; Da Nang, 12.1 percent; Hai Duong, 9 percent;Binh Duong, 8 percent; and Dong Nai, 7.4 percent. Ho Chi Minh and Hanoi rose 7.1 and 5.9 percent respectively. The GSO also revealed that the inventory index of the industry sector as of April 1 was up 12.7 percent over the same time in 2016.